← November 12, 2013 Dion and his Lucky Girls! 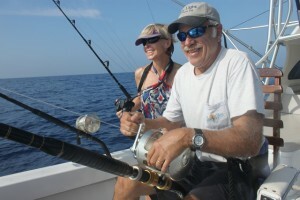 Al and his wife Gray have fished with me for three years! They didn’t make it to Kona last year but instead went to Costa Rica in search of roosterfish and sails. On this short vacation they decided to again try their luck! I was feeling a little “under the weather” in the morning and almost cancelled but I knew Al was really looking forward to fishing so I sucked it up and went. They know I like to leave early to get a jump on most guys so we left at first light. We ran pretty far before we started trolling in hopes of running into a blue marlin or maybe even a mahimahi which have been around in pretty good numbers lately. A few hours into it we found another nice porpoise school. They weren’t very active but I decided to go right to the greenstick. Al loves this type of fishing because the bites can be incredible at times. As I made my first pass I marked an ahi in the school and told them to watch the pattern. A nice ahi boiled up on one of our baits and missed it! 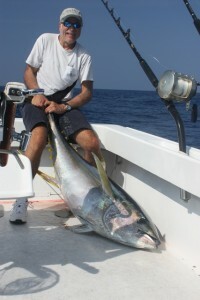 As Al and Gray looked on, a big ahi zeroed in and blew up on one of our squids! Al jumped in the chair and angled our first ahi to the boat in about 15 minutes! 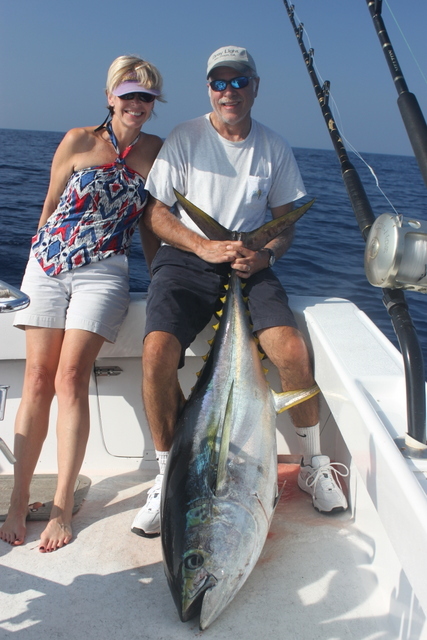 Our first ahi would scale out at 108lbs! I reset our lines and went back to the porpoise. It was a big pile that was stretched for about 1/2 a mile. I didn’t see anymore fish there. I went back to another portion of the pile and marked two more ahi lurking deep. I told Al and Gray to watch for a bite and sure enough, another ahi came up and ate! Again, Al was up! I thought the fish was smaller than the first because of the small boil it left on the bait. I changed my mind (as did Al) as line peeled off the Fin Nor 130! 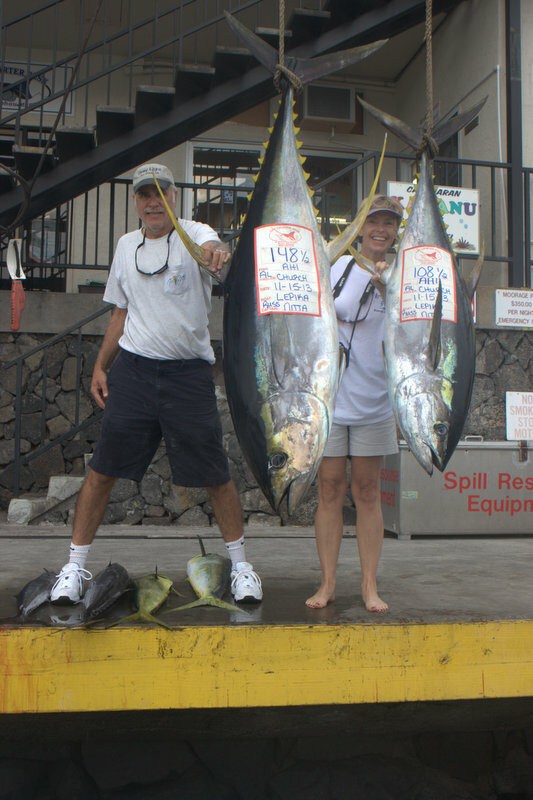 Al would land our second ahi in about 20 minutes and it hit the scales at 148lbs! I didn’t see any other fish in the school so we decided to head inshore for maybe a marlin, mahimahi or ono. I took us to an area a friend of mine had caught some onos at the previous day. We had just set up the ono lures when the short bait fired off! Unfortunately the fish came off on the run. Ugh! We continued on and about 20 minutes later a nice size ono ate the short rigger! Al has never caught an ono and now was his chance. His ono would weigh about 30lbs! 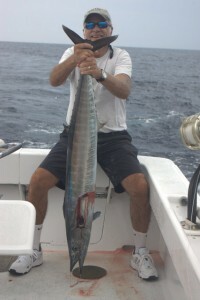 As we worked our way down the coast, we caught another ono. This one not big enough to even release the line from the outrigger! 10lbs…maybe! On we went trolling close to the ledge. Al and Gray said a mahimahi would be nice…Boom! We take a triple mahimahi bite and manage to land one of them! Wow! What else could happen? As we continued on we thought, “maybe we could catch a blue and get a clean sweep” . A clean sweep is catching all four flag fish in one day. We already had two nice ahi, two ono, and a mahimahi so we were 3/4 of the way there! I switched over my pattern to more marlin type lures…big lures! As I neared the harbor I decided to call it a day and went down to clear lines. I’ve caught big blue marlin less than a mile from the harbor so “it isn’t over until the last line is in”. As I cleared two lures from the pattern the short rigger came slamming down and line was screaming off the reel! Out of the corner of my eye I saw a splash but not a good look at the fish. Al came flying down from the bridge and got in the chair. Just then line stopped peeling off the reel and started angling out to the side…tell tale sign of a big mahimahi. Sure enough, what we hoped was a small blue marlin ended up as a nice 30lb mahimahi! We had plenty of fish for dinner and called it a day! As we weighed our fish the 30lb mahimahi was still kicking on the dock! Al and Gray will be back in June for some summertime action!